The ideal tool to dress any tire! The Car Pro Tire Swipe Applicator was designed to make applying a tire dressing to you tires as easy and efficient as possible. There are so many different types on tires and wheels out there that it can be difficult to find an applicator that is able work effectively on all of them. It is for this very reason that the Car Pro Tire Swipe Applicator was designed with a unique asymmetrical radius that allows you to apply a tire dressing or gel to the outer edge of your tire without covering your rims in the stuff! You will experience a noticeable increase in durability when you compare the Car Pro Tire Swipe Applicator to other tire dressing applicators that are on the market today. The Car Pro Tire Swipe Applicator was designed with a tough steady grip handle, so it can stand up to repeated use and abuse! 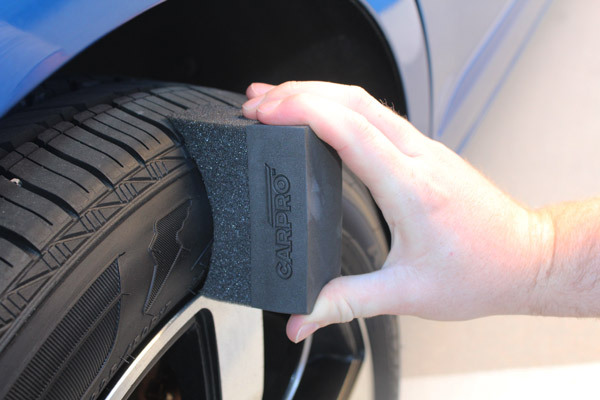 The CarPro Tire Swipe Applicator conforms perfectly to the surface of your tire for complete coverage! The Car Pro Tire Swipe Applicator is made with a much denser foam that keeps more of the dressing or gel on the surface of the tire. This means that your tires are able to absorb more of your dressing and you will receive better results from your chosen tire protection! Whether you want your tires to be matte black or high shine, the Car Pro Tire Swipe Applicator will make sure you get the best finish your tires have to offer!